Passing, receiving and settling for ground and air — the Quickster Soccer Trainer’s patented design and true-roll action give players the reps they need to master first and second touches. Built to help soccer players improve passing, receiving, and settling for ground and air, the Quickster Soccer Trainer’s patented design and true-roll action gives players the reps they need to master their first and second touches. Designed to help players master passing/receiving and improve ball control from head to toe, the Quickster Soccer Trainer returns the ball with game-like conditions. This rebounder’s patented design allows players to practice volleys and half-volleys with instep and laces with the same ball action they’ll experience in a game. At the same time, it helps build skills through repetition training for more precise ball handling and powerful striking. 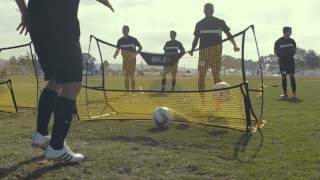 The Quickster Soccer Trainer sets up quickly, stands up to the hardest passes and stores easily. Lightweight yet durable, this multi-touch rebounder helps players develop their skills in ways that leaves all other rebounders flat.